PRESIDENT Emmerson Mnangagwa yesterday handed over 1 444 head of cattle to farmers in Matabeleland North at the official launch of the provincial Command Livestock and Fisheries Programme at Arda Jotsholo Estate in Lupane. The President last month officially launched the $10 million Command Livestock facility to cater for Matabeleland region in Gwanda where he also handed over 1 660 head of cattle to farmers in Matabeleland South. Beneficiaries of the cattle distributed yesterday were drawn from Matabeleland North's seven districts. Addressing beneficiaries and guests, President Mnangagwa said his Government has an all inclusive approach in its development programmes. He said after realising that provinces are not the same, Government decided to start Command Livestock which is meant to cater for those dry areas that do not receive much rainfall like Matabeleland North, Matabeleland South, southern parts of Midlands, Masvingo and parts of Manicaland. "In Command Agriculture producing grain, we have succeeded, we now have enough grain in the country. Indlal'isihambile ayisekho. "Under that model of grain production, we are happy, we will continue to support it and make sure that Zimbabwe shall never suffer from grain insecurity again. That is done and what we are now doing with regard to grain production is to make sure every hectare produces more, modernise and mechanise our agriculture to produce more," said President Mnangagwa. "But provinces like Mat North, Mat South, Midlands South, are not suitable for grain, yes you can grow small grains but not much. It's more suitable for Livestock yikho sisithi hayi sesibisa inkomo ngapha. Every province, saqala nge Matabeleland South we gave 1 660 cattle three weeks ago to farmers who included women and youths." President Mnangagwa said under the crop component of Command Agriculture, farmers start paying after six months of receiving inputs but under Command Livestock, farmers pay after five years. "After five years, if you get amathokazi angu three loba angu ten kumbe njenge zinduna labe A2 esibanika five or ten amathokazi, after five years zizaba lamathole amathathu or four, so after five years uzabhadala the first one, ezinye lezi ezintathu nge zakho awusoze ubhadale," said President Mnangagwa. "So yi programme enhle kakhulu yokuthi abazali ema khaya banothe, we are empowering the households at home. Omama labafana abatsha sizabanika inkomo but not to eat them but to breed ukuthi zande. "That's the programme of the new dispensation. Sifuna ukuthi abantu banothe emizini. This is just the beginning, we will continue like this until almost every single household can say this is what my Government is doing for me but we had to begin from somewhere and we are beginning now." 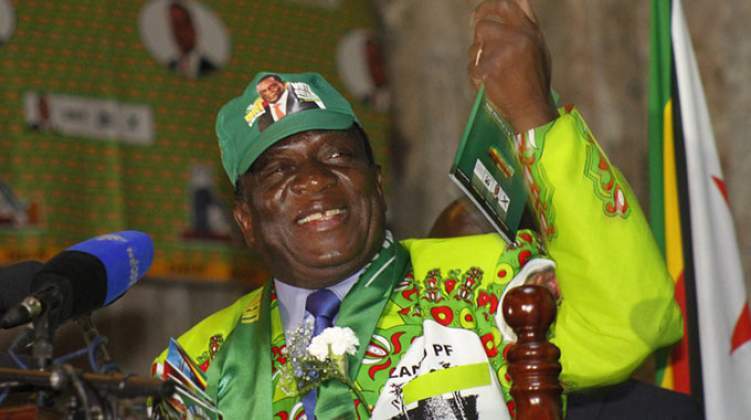 President Mnangagwa said he had discussions with his deputy Vice President Constantino Chiwenga and agreed that Chiefs would receive up to three bulls to service their respective areas. "The chief will have two or three bulls to transform the breed in his area. After five six years from now we will be going round seeing the beautiful breeds of cattle across the country," he said. "They will give you fish fingerings in hundreds of thousands and after six months, hawu sidle inhlanzi. We are distributing for free to empower our villages," he said. "It is how the economy must grow, no one must be left behind, no community must be left behind, we must all move together. Besides, we are now saying economy, economy, economy, we want to develop. Politics yes but economics first, isisu first, then pamberi ne Zanu-PF follows when you have a full stomach. That is what we are doing." "We thank you for the gift of livestock and we want to assure you that they would be put to good use. I'm happy that you said this is the first phase of the distribution because it means that many people will benefit from this programme," he said.